Carverson, under jockey Manual Gutierrez, setting the fastest time in Saturday's South Florida Quarter Horse Derby trials at Hialeah Park. HIALEAH, FL�JANUARY 26, 2012�Jose Herrera's Carverson was an impressive one-length winner over Mi Angela in the last of four trials Saturday afternoon at Hialeah Park for the South Florida Quarter Horse Derby. The 10 fastest qualifiers will return to the South Florida raceway on February 16 to vie for the winner's share of a $100,000-added purse to be contested over the classic Quarter Horse distance of 440 yards. Under jockey Manual Gutierrez' the lightly races Carverson scored his second career win in just five starts. He posted a :21.751 time, a 91 speed index over the 440 yard distance. Carverson was fourth in the Hialeah Park Laddie Futurity on December 30, his last start after breaking his maiden and setting the top time trial for that stakes. Jose Herrera conditions the WAVE CARVER colt bred in Oklahoma from the Ronas Ryon mare Miss Razz Chick. 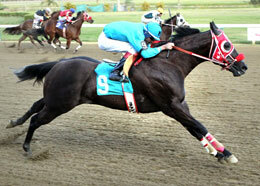 Pazazz Quarterhorses, Ltd. bred the earner of $32,634. The royally bred Mi Angela held on for the second fastest time of :21.912. Rolando Almanza saddled the daughter of Dashin Follies. A half-sister to leading sires PYC PAINT YOUR WAGON and IVORY JAMES. she broke her maiden in her last start on January 12 at Hialeah. Agustin Silva rode her for owner Cesar Rosales. IVORY JAMES also sired the 5th and 6th fastest qualifiers James On The Run and Rawhide Creek. Coming off a win in the $86,270 Hialeah Laddie Futurity on December 30, James On The Run suffered his first loss in five races. Brandon Muniz trains the gelding out of Injun On The Run, by Invisible Injun, for Rancho Los Dos Potrillos, LLC. Bobby Cox is the breeder. Rawhide Creek won the Hialeah El Nino Invitational in his last start on December 29th for owner's Dutch Masters III. The John Stinebaugh trainee has won four of nine starts. Jim Streelman and Bill Dale bred Rawhide Creek in Missouri from the Pritzi Dash mare Pritzi Too. For a complete list of Florida Quarter Horse Derby finalists, times, sires, dams, owners, breeders, trainers and jockeys CLICK HERE.